Today, let’s wrap up A Stitcher’s Christmas for 2018, shall we? 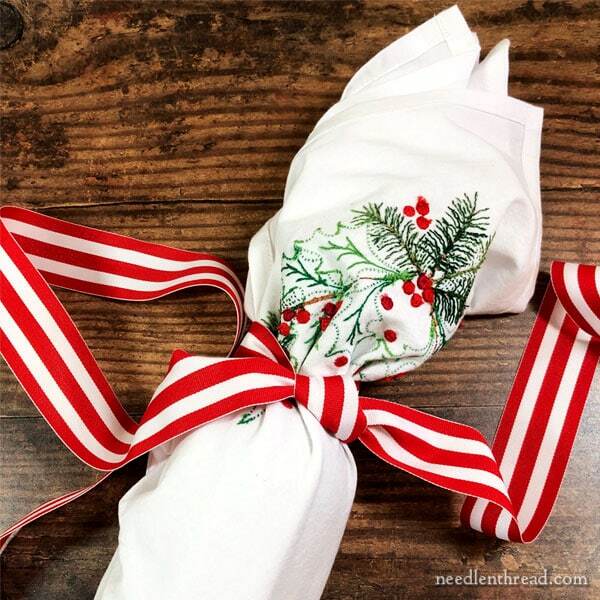 Then I’ll show you one way I use embroidered flour sack towels to wrap gifts, for those of you playing Santa this year! This morning, bright and early, I randomly drew the winner for last Wednesday’s installment of A Stitcher’s Christmas, these gorgeous specialty silk & metal threads, courtesy of Access Commodities. The winner of the threads is Jackie Ayres. Then, I randomly drew the winner of Friday’s give-away, an exquisite pair of embroidery scissors courtesy of The French Needle. And the winner of the scissors is Kathy M! I’ll email both of you today. I know you’ll love your new needlework treats! I love using embroidered flour sack towels as wrapping for gifts. They work especially well for pretty much any small household or kitchen gadget, they can serve in place of tissue paper inside a gift bag, and they can line a gift basket or even a plate of cookies. 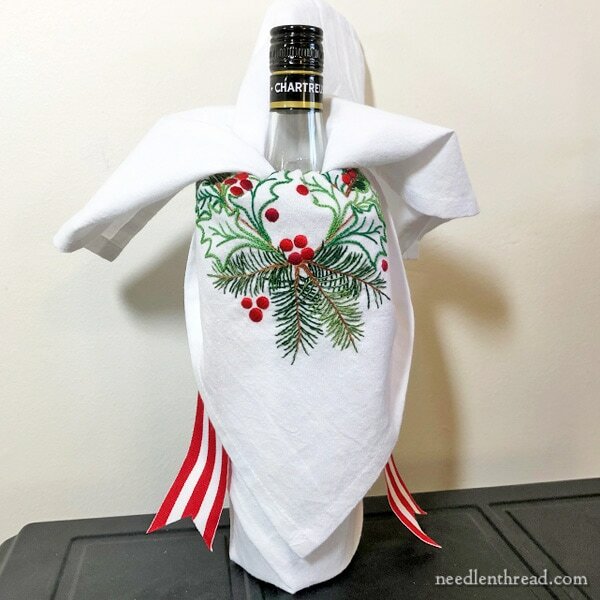 Around Christmas time, when a bottle of Christmas cheer in the form of wine or liquor makes a good gift for the dinner host, an embroidered flour sack towel can come in pretty handy! It’s easy to use a square or almost-square flour sack towel to wrap a bottle. Lay your embroidered towel with the embroidery face up out on the table. Place the standing bottle in the middle of the towel, and draw all four corners up, to meet at or over the top of the bottle. At this point, the back of the embroidery will be facing outwards. If you happen to have a new soft pony tail elastic or something similar, this is a great place to use one! I didn’t have one, so instead, I tied a wide, striped, grosgrain ribbon around the neck of the bottle, as shown in the photo above. No need to tie a fancy bow, because it won’t be seen. Stand the bottle up and fold the corners down over the ribbon. You might just fold the embroidered corner down, to display the embroidery, leaving the other three corners standing up and somewhat hiding the top of the bottle. Or you can fold all four corners down – just make sure you fold the embroidered corner in such a way that it stands out and gets all the attention! If you’re using a ribbon, snip the ends to make a good presentation, and if you want, you can slide the wrapped bottle into a plain gift bag (remember: you want the embroidery to get all the attention!) to make it easier to carry. Voilá! A nice little gift for whoever’s hosting Christmas dinner! I’ll be taking a short blogging break until the end of the week, to celebrate Christmas with my family here in Kansas and to get ahead on a few things for you, for the New Year. All my warmest wishes to you and your loved ones for a joyous, peaceful Christmas, filled with an abundance of blessings that will carry you through 2019! Merry Christmas Mary. Health and happiness to you and your family for 2019! Blessings to you and yours, Mary. And to all the other stitchers hanging around. Have a Merry Christmas and a safe and Happy New Year. Blessings to you and your’s. Thank you for all you do. Merry Christmas, Mary. Thanks for all the tips, techniques, and just plain beauty you share with us through the year. All the best to you and yours for 2019. Mary, Outside my window right now the snow is gently falling…and it looks like a Christmas Card! What a wonderful Christmas Eve! I hope you and your family have a great Christmas season! Merry Christmas, Mary! Wishing you a beautiful Christmas and a very happy new year ahead. May it be joyous, fun and filled with love and adventure! I wish you and your family a really Happy Christmas and a Joyous time and a Peaceful New Year. Thank you for all you have done for us here on Needle n’ Thread and for your continued inspiration, friendship, guidance and your enthusiasm and I can’t wait for all your future blogs which are always so interesting. Have a great time. Mary, I wrapped all my gifts in cloth. No waste, no hunting for tape! Your towel came out great. Merry Christmas Mary! Enjoy the family time! Merry Christmas to you. May you and your family enjoy all the blessings of this most wonderful season. Best Wishes for 2019. Mary, a Very Happy Christmas to you and your family! 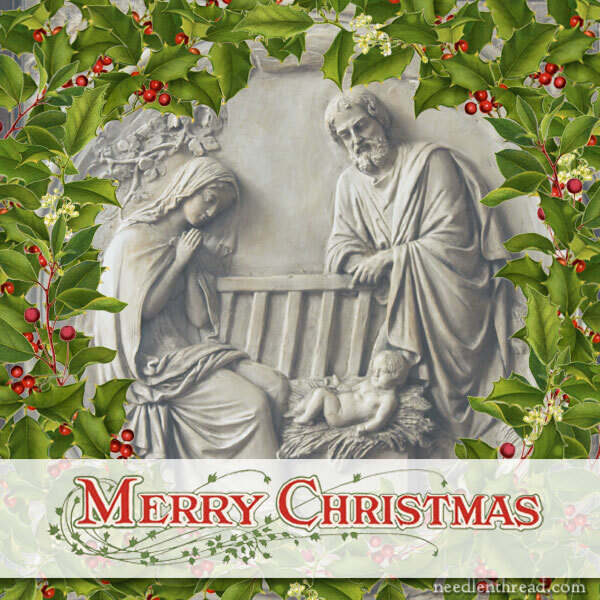 Merry Christmas Mary to you and your family! Congratulations to all the winners, and blessings and joy to all this Christmas! Mary thank you for your hard work and inspirational blogs. Very best wishes for a wonderful Christmas and a very restful break. Merry Christmas and may you be blessed in the New Year with all that you wish for. I’ve now been reading Needle’n’Thread for nearly a year, and I have learned soooo much! Thank you for everything!! Hi, Karen – I don’t trace the designs on the flour sack towels that I sell. When I do trace a design onto cotton or something similar – like a fine linen – I’ll use a pencil or, occasionally, a micron art pen (Sakura), but the latter, I only use on projects that won’t normally be washed. The Sakura Micron art pens are permanent, but they are not guaranteed permanent on fabric, so if I use them, I always iron over them after tracing, to kind of set the ink (just in case), but it’s always on projects that won’t be washed. Normally when I use pencil on pieces that will be laundered, I spray starch the fabric well before doing the transfer. Then I trace (I use a light box when I trace), then stitch, then give it a good rinsing or soaking to remove any pencil. Then I block it and let it dry. This method works fine when using threads that are colorfast and will hold up to laundering. If you’re using overdyed threads that aren’t guaranteed colorfast, you wouldn’t want to set up your project in any way that would require laundering after wards, and you’d want to be very careful to keep things clean while working the project. It’s always a good idea to test threads first for colorfastness, as there’s nothing worse than the panic and disappointment when you rinse a piece and the colors run! In any case, a pencil and spray starch is a great way to trace a design! If you are sure you will cover all the lines of your design and you want to make your own iron-on transfer to use, then I’d suggest Sublime Stitching’s fine-tipped iron-on transfer pen. It works well! But it is permanent, so you have to make sure your lines are completely covered while you stitch. If you’re planning extremely fine or delicate embroidery, it might not be the best option. So there are some ideas to get you started! Sorry to hear that your mom is ill. Hope she is better soon. Thank you for the articles in Needle N Thread this year. I don’t remember how I found this site but it has changed my idea of what I can do with my embroidery. You have shown us a lot of places where we can find patterns, thread and tools to help with our craft. I had no idea that places like that existed. Loved the Christmas flour sack Holly and Evergreen , the Acorn pattern and looking forward to the corner designs from last summers class. You are a very good teacher and designer. Wishing a very HAPPY NEW YEAR . Previous Previous post: A Stitcher’s Christmas, 2018: An Exquisite Pair of Scissors! Next Next post: Bye-bye 2018, Hello 2019!